And he’s right: His dramatic weight loss and improved health and fitness haven’t gotten the attention they deserve. Brown—not to be confused with West Coast rapper and producer Andre “Dr. Dre” Young—is one of more than 29 million Americans with diabetes. According to the New York Times, Brown acquired Type 2 diabetes 10 years ago due to a poor lifestyle and has since lost a toe and his sight to the disease. He’s planning to have weight-loss surgery to alleviate his symptoms and wants to showcase the process and recovery on a proposed reality-TV show. Here’s the problem: A reality show featuring bariatric surgery as a treatment for Type 2 diabetes shines a spotlight on a last-ditch effort that comes with a lot of risks. It’s like showcasing an arm amputation because a cut on a hand was left untreated for years and no other options remained. We’d prefer to focus on the dramatic effects of diet and exercise—non-medical health care that works. Medicine doesn’t have an answer that’s not symptomatic treatment. Medicine’s answer doesn’t work. For another example of how diet and exercise can be used to reduce disease risk, you need only look to Ross—who works in the exact same industry as Brown. Since starting CrossFit in 2013, the Grammy-nominated Ross has lost about 100 lb. through diet and exercise. After two 2011 seizures sent him to the hospital and forced the artist to evaluate his health, he cut out soda, drank less, adjusted his diet, slept more and started working out. Ross—who is not diabetic—isn’t perfect. He works in an industry characterized by late nights, travel and parties, and he owns a host of Wingstop franchises. Be that as it may, he changed his lifestyle, lost a large amount of weight and significantly reduced his risk for chronic disease. As they say, an ounce of prevention is worth a pound of cure. We know we can prevent, control and reverse Type 2 diabetes through diet and exercise. 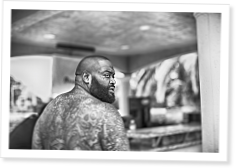 If we’re going to look to the hip-hop community for inspiration to lose weight and improve health, we’ll choose Ross over Brown. Additional video: “From Couch to Capable” by Gary Roberts, published May 5, 2014. A recent CrossFit Journal editorial on bariatric surgery for weight loss set off a lively debate on Facebook. By Roy Masters’ reasoning, most weightlifters in the Olympics aren’t very strong. Spotted barbell biceps curls and white A-shirts, with just a hint of oil in place of sweat?